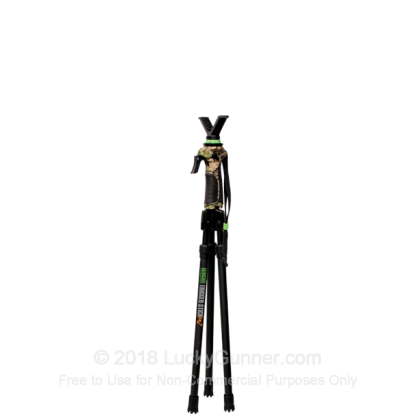 Height - 18" to 38"
If you have the room to carry a tripod, this Primos Trigger Stick model is a great choice for maximum stability in a shooting platform for rifles or as a mount for optical equipment. Each leg, made of 7071 aluminum, telescopes to adjust the tripod's height from 18 to 38 inches. The Trigger Stick's signature one-handed height adjustment at the top provides additional flexibility and speed. This tripod supports devices with 1/4"-20 and 3/8"-16 threads and includes a removable V-yoke that provides 360 degree rotation. Great for making stable shots in a crouched or kneeling position. This tripod weighs less than 2 1/2 pounds, making it an easy tool to carry with you in the field.